FOXBOROUGH, Mass. -- Tom Brady is on the verge of making history again. FOXBOROUGH, Mass. — Tom Brady is on the verge of making history again. The New England Patriots quarterback can become the NFL’s all-time winningest starting quarterback in playoff history if his team can beat the Houston Texans Sunday in the AFC Divisional Playoff at Gillette Stadium. His record is 16-6, tied with his idol, Joe Montana, for most playoff wins all-time. Whereas the Texans have been in the playoffs only twice in their brief history, the Patriots have been a playoff lock since 2001. They know what this time of year is all about. Which is probably why they were all wearing their game faces already on Wednesday. The Patriots said all the right things Wednesday: forget about the 42-14 whipping the Patriots put on the Texans here on Dec. 10; concentrate on the task ahead; be ready for the Texans’ best game. And they all talked about the risk factor. There is a fine line in playoff football: do you play conservatively, minimizing the chance of mistakes, or do you continue to play as you always have? Bill Belichick, the Patriots head coach, answered that emphatically. “You don’t win a war by digging a foxhole and sitting in it,” he said. “You’ve got to go out there and attack. And Brady knows this perhaps more than any other Patriot player. As the quarterback, the ball goes through him on every offensive player. He makes decisions that are going to either win games or lose them. “It’s always about risk-reward in football,” he said. “I think there are calculated risks and judgments that you make as a player on every single play, whether that’s my position or whether you’re a defensive tackle. Should I try to go for it or should I not? Brady has rolled the dice many times in his playoff career. With three Super Bowl championships and five Super Bowl appearances, it’s obvious that he has been right most of the time. “I don’t think you can play so conservative that you’re not able to go out and make plays,” Brady said. Not every play is going to be good. 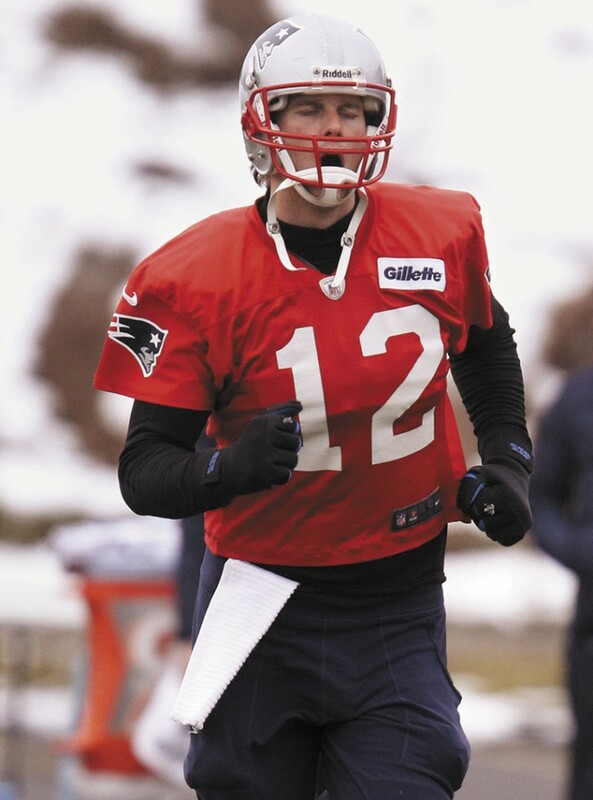 Brady pointed out that in 2006, he threw three interceptions against San Diego in the AFC championship game. But New England won 24-21. That’s the message Brady and the other veterans are passing along to the team’s 18 playoff rookies, a group that includes 10-year veteran wide receiver Brandon Lloyd and fifth-year cornerback Aqib Talib. Belichick was asked if he had ever seen a team completely reverse its style for the playoffs. He proceeded to talk about the 1990 New York Giants, for which he was the defensive coordinator. In the playoffs against the Chicago Bears they played a 4-3 defense. In the NFC title game, they played a 3-4 against San Francisco. In the Super Bowl victory against Buffalo, they played a 2-4 nickel, or a 3-3 nickel. “We weren’t trying to be creative, we were trying to win the game,” said Belichick. And that is what is most important in the playoffs, and something the Patriots understand perhaps better than anyone else. “At this point of the season, you do what you need to do to win one game,” Belichick said. “You don’t worry about your system. You don’t worry about playing time. Your worry about what you need to do to win the game. For the Patriots, more often than not it does.